So Frosty joined you on the sunny shores! 🙂 Hope you had a lovely and warm Christmas. 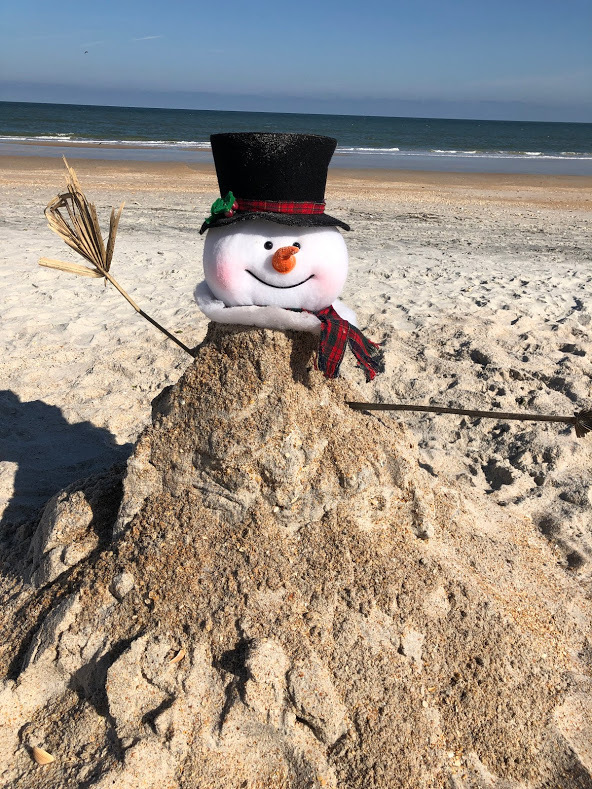 Love our Florida “snow”man. Hope you are enjoying your time. We were at my in-laws house yesterday and it was sooooo windy at the beach but also so beautiful. I definitely will need to make some time to walk on the beach during our break! So cute! I remember once we went to Florida (from Michigan) for Christmas. It was fun but felt really odd, even as kids we thought palm trees and Christmas just didn’t fit! Now that I’m older I’m much more flexible and Christmas and palm trees would be just fine. Now there’s a snowman the likes of which I’ve never seen. Izzy and Grandpa’s snowman is still standing in our backyard, just a bit thinner and without eyes. Now that a snowman for all seasons. Just showed this to mom and she loved it. I saw that on the news. Hope it passes you by!